Discrimination against gays by the Boy Scouts is a big deal because a) it's otherwise one of the best organizations for youth and b) helps define what being a "man" means. This new TV show will tackle the issue head on. With the BSA's recent change in membership policy, youth members are no longer excluded based on sexual orientation, but parents and adult volunteers are still discriminated against. This chasm has created a question that needs to be answered. What happens when a gay Scout turns eighteen? You can help us answer this question, and maybe even change the future. While this is a big inspiration for the show, it's not the only story we're telling, not by a long shot. We're telling authentic stories inspired by real experiences that we hope people can relate to; some that will bring light to important issues; and some that are just plain fun. In telling our story we hope to lend support to what America needs now more than ever; the awesome potential of Scouting for shaping boys into the men who will lead us into the future; men who treat everyone equally regardless of their gender or sexual preference. As you can see, the show isn't just attempting to tell the story of gays in scouting, but to look at how the identity of American males has changed over the last few decades. Where the ideal used to be something like Camp Abercorn shooting instructor Tom Russell, increasingly that type of character is finding it hard to relate to modern society on familiar terms. 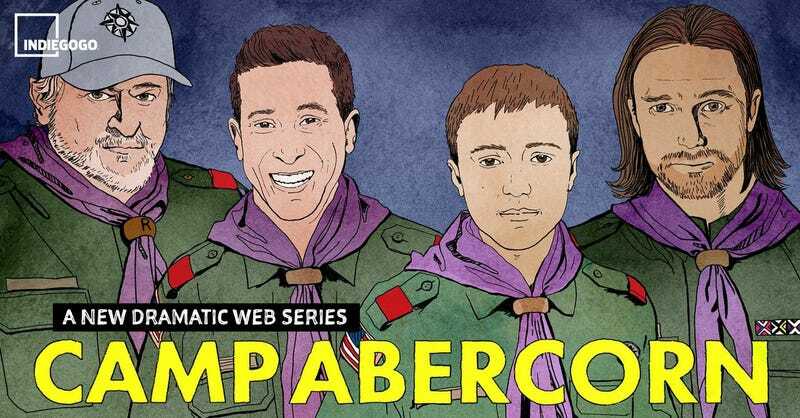 Now, men like Abercorn camper Colin Benton-Powers are more common. He might be descended from scouting's father, but the outdoors is an utterly alien place to him. What value can a scouting experience hold to citizens of the 21st century? The whole thing looks like a sweet, genuine story capturing the breadth of experiences experienced as different personalities learn to be and grow into men through scouting. That it seems to have a touch of Wes Anderson's self deprecating humor should also help make the whole Scouting thing much more relatable to people who haven't been through it. Turning a warm, friendly spotlight on these issues will hopefully help frame the conversation around them and help the Boy Scouts move towards a more inclusive future. The catch is, Camp Abercorn needs your help. The show is on IndieGogo right now, working towards a $100,000 funding goal with just three days left to reach it. I hope it does.